An authoritative guide to boosting your nonprofit’s bottom line through effective telephone fundraisingPresenting a detailed structure for writing effective telephone call „scripts“, Effective Telephone Fundraising explains the necessary and effective components of an effective call from beginning to end, and provides helpful hints, detailed examples, phrases to employ, phraseology to avoid, and a „road map/chart“ for structuring effective call scripts. This how-to manual examines in detail the various stages of an effective telephone call from identifying the prospect and introducing yourself; getting through screens and talking to the decision maker; developing rapport and a creating two-way conversation; explaining the purpose of your call; making a proposal to the prospect;the process of negotiation and effective closing strategies; results of the negotiation;and ending the call. 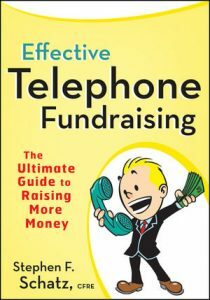 A complete, start-to-finish guide for successful telephone fundraising, Effective Telephone Fundraising helps you structure effective call scripts for your nonprofit’s best advantage.